Edited to Add (January 20, 2012): Finally it’s done. Vodafone won. Edited to Add (28 July 2011): Vodafone is still in battle. It’s created an escrow account for $2.5 billion — but says that if it loses, the actual bill (with penalties and interest) could be twice that. Ouch. The case is to restart in two weeks. Watch this space. Edited to Add: In December 2010, the Dutch Government apparently got involved, with a formal application to the Indian government saying the tax demand is incompatible with a double-taxation treaty between the two countries. I’m breaking out the popcorn. This is going to be interesting. Back in August 2009 when I blogged that the Supreme Court had turned down Vodafone’s appeal, leaving it on the hook for an estimated $2.7 billion (yes, billion with a b) in taxes, I thought it was over. But it isn’t, quite. The year is 2007. Hutchison, a Hong Kong company wants out of its cell-phone company in India, a joint venture with Indian company Essar. Fortunately, European company Vodafone wants in. Hutchison’s Indian interests are held, indirectly, in a Cayman Island subsidiary. Vodafone also has a Cayman Islands sub, which buys out the Hutchison subsidiary for $11.1 billion. Now Vodafone has an Indian cellphone company, which it rebrands in its own name. Because the whole deal is offshore, everyone believes they’ve avoided Indian capital gains tax on the sale. Everyone except the Indian tax authorities. They want $2 billion in taxes. They argue that the Indian cellphone company on the ground in India acted as an agent for the seller. Vodafone says they owe nothing. First, the whole transaction was overseas. Second, even if capital gains tax was due, they’re the responsibility of Hutchison, the seller, not of the Indian company on the ground (which is the only one the Indian tax guys can get at). In Sept 2007, the Tax people asked Vodafone for the money, saying that Vodafone should have withheld taxes at source when it paid Hutchison. 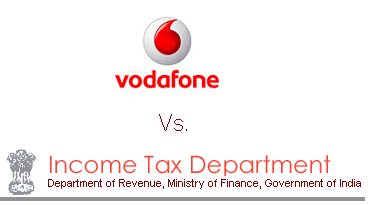 Vodafone filed a writ petition with the Bombay High Court saying the Tax Department had no jurisdiction. The Bombay High Court dismissed the petition. Vodafone filed a Special Leave Petition with the Supreme Court. The Supreme Court sent the thing back to the Tax department, but said Vodafone could appeal to the High Court (again) if the tax guys ruled against them. In May 2010, the Tax department sent Vodafone a letter saying it intended to treat it as an agent of Hutchison (which was actually liable for the capital gains tax, but had made a clean getaway.) This was, Vodafone said, a new tack entirely, and could result in a higher liability. Vodafone promptly filed a writ petition with the Bombay High Court. Vodafone filed another appeal with the Supreme Court, with a hearing planned for October 25th. Meanwhile, it also appealed to the High Court, with a hearing on October 27th. 1. Can the Tax authorities ask for any taxes at all on what is apparently a sale of one foreign company by its parent company to another foreign company? Here, the courts seemed to have ruled they can, because the effect was to give Vodafone control of the Indian company. 2. Since it was Hutchison’s responsibility, what is Vodafone on the hook for? Is it for not witholding taxes as it paid Hutchison? Or is it as a de facto an agent for Hutchison? Has Vodafone lost this one? It’s looking like it. However, on the website of the law firm of Nishith Desai (who I first met in the 1980s and he was already eminent) who is representing Vodafone as special counsel, there’s an article written by Aditi Mukundan and Bijal Ajinkya. It’s a PDF note entitled The Vodafone Decision: All is Not Lost. When I blogged about it in August 2009, Vodafone had just lost in the Bombay High Court (the first time), and the Supreme Court had refused to hear them. It sounded like it was over. It wasn’t. In fact, there’s already word that this is a test case, and Indian tax authorities are going to look into other, similar, transfers. So if your company acquired India assets by buying them offshore from another foreign firm: Be forewarned. And one more suggestion, from the Nishith Desai and Associates article: Opt for advance rulings about tax liability. This entry was posted in Doing Business in India and tagged Nishith Desai, taxes, vodafone. Bookmark the permalink. I liked the simple lucid reporting of the Hutch-Vodafone-Income Tax tangle. I wish journalists in India wrote this clearly, specially about finance and business issues. Do a follow up some time, please. Personally I believe that many offshore companies are shell companies meant to evade taxes. We are seeing more and more evidence of this as Indian business goes global. The scams now usually involve money hidden abroad.